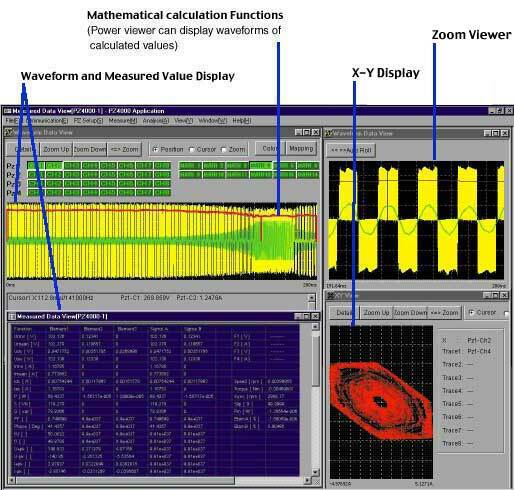 The Power Viewer software for personal computers allows you to transfer measured data from a PZ4000 Power Analyzer to a PC via communications or removable storage media, and to display and analyze the data on the computer. Power Viewer lets you display waveform data, measured parameters, and draw X-Y graphs such as a speed-torque curve from an electric motor. In addition, mathematical functions can calculate data from multiple channels of the maximum record length?4 megawords per channel?and display the results simultaneously. To assure the simultaneity of data that is essential for multiple signal measurement, Power Viewer can perform synchronous measurement with up to four PZ4000s *1. With Power Viewer, you can view all the measured data on the same screen at once ideal for measuring multiple signals that change level drastically! *1: RS-232 available only when connected to a single PZ4000, and GP-IB must be used when more than one PZ4000 is connected. Even if these system requirements are satisfied, performance may vary in your hardware. Please install the "Trial Version" of the software and check for system compatibility before purchasing the retail editon. Download the file below (PowerViewer.zip) to a folder on your PC. Unzip it to restore PowerViewer.exe. Overwrite your old dlwave.exe file with the new one. Run the program, and confirm the version number is "2.02". To upgrade the Power Viewer software program, the previous version of the software must be installed in your PC.